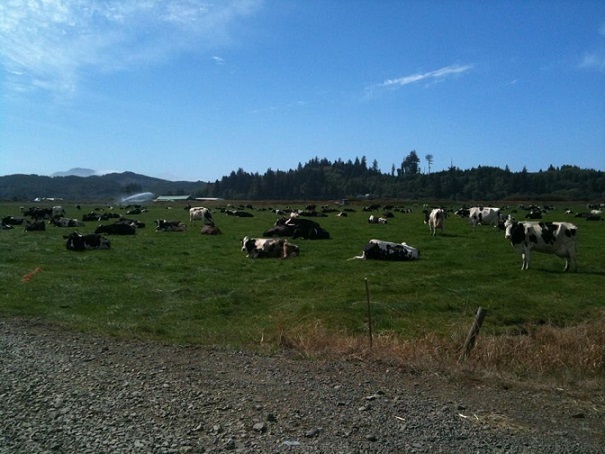 Imagine my surprise when I saw this photo of cows resting around a pasture from Oregon. Here in the Heartland, cows stand up. What are these cows doing – resting and being lazy? Don’t they know that cows stand up? You would never find a Heartland cow being so lax. This is how we sort things out in our minds. We compare things to what we are familiar with. We judge things by our past experiences. We also like to make the way we do things the best in our minds. Does it matter if cows are resting or standing? Probably not. And we can be certain that the cows don’t care. They are doing their jobs perfectly by just being cows. Next time you see someone doing something a little differently than you are used to seeing, stop for a moment. Observe it. If we can stay in a place of observation, we won’t judge. And we may actually learn something new. Years ago I was on a long bicycle ride through the Colorado Rocky’s. Running out of time, and needing to return home, I ended up hitching a ride — picked up, bike and all, by an elderly school bus driver who’d just dropped a load of teens off at a camp. That is truly fascinating and I really did not know that about cows. Thanks so much for this post – learned something and was very inspired too!! I agree — cows are a fascinating subject — even to the ETs! : ~ ) Thanks for including cows in your commentary!